Whether you're a full-time vegetarian, someone who needs to stay away from meat for health reasons, or you're just taking a holiday from meat, you'll be happy to know there are some great places on New York's Long Island to enjoy delicious, meat-free dishes. Some of the restaurants listed serve all kinds of food, including vegetarian specialties. Opened in the summer of 2015, this restaurant is the only all-vegan eatery on Long Island. Owned by Jay Astafa of 3 Brothers Pizza Cafe in Farmingdale, this venue is packed to capacity with those who love delicious, healthy food without meat or dairy products. In 2009, 3 Brothers added a separate upscale vegan menu to its standard offerings of pizza with meat toppings, making this a cozy place that's great for vegan dining with carnivore friends. The new menu includes appetizers like oyster mushroom scampi and no-meat, no-dairy, all-delicious seitan Marsala and eggplant rollatini. There are also savory whole wheat and gluten-free pasta, for instance, whole wheat crust with pesto sauce and more. There's also a decent wine list. In 2011, the restaurant received PETA's award for the Best Vegan Pizza in the United States. Initially located in Rockville Center, the restaurant moved to Farmingdale in 2012. Hicksville is famous for its many Indian restaurants and boutiques. The House of Dosas is totally vegetarian, and you'll find many Indian families enjoying meals here. 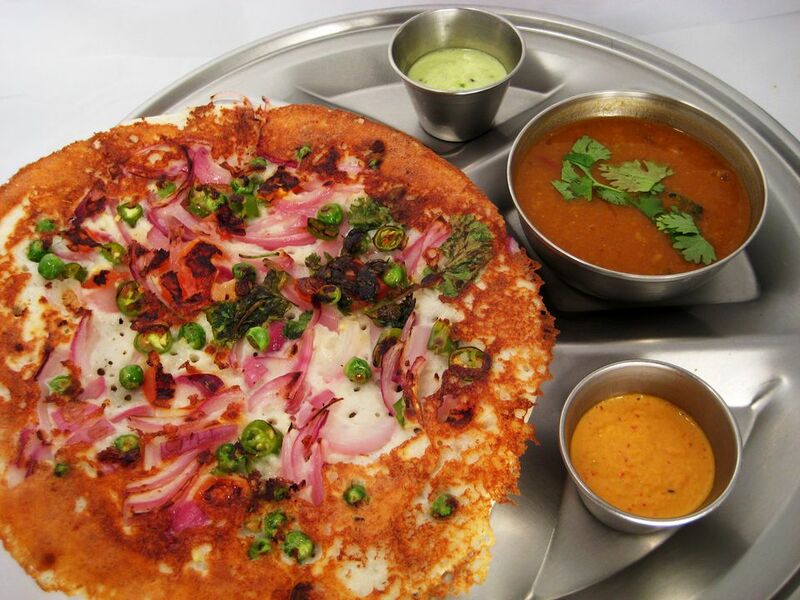 The restaurant specializes in South Indian food, and they'll honor your requests for mild or spicy meals. As the name implies, you're going to get a lot of dosas here. These large, paper-thin lentil crepes can be ordered with fillings like onions and potatoes, or other tasty ingredients. Their delicious vegetable curries range from eggplant curry to vegetable korma, cooked with coconut and mild spices. Naturally Good Foods & Café is primarily a health food store, but there's takeout and you can enjoy your food at a few tables in the back of the store or at tables in the backyard. The restaurant serves breakfast and lunch every day year-round and offers a wide range of fresh juices and smoothies. The muffins are freshly baked and there are multigrain pancakes as well as sprouted grain bagels for breakfast. For lunch, there are salads, platters, and even tuna for non-vegetarians. Kids can choose from a tasty whole wheat peanut butter and banana wrap, grilled cheese on 7-grain bread, tofu doggies, and more. Port Jefferson's Tiger Lily Café has a sixties retro look, and the vegetarian dishes, as well as non-veggie meals, are served in a funky setting with psychedelic art. Music plays while you eat or amble outside in warmer weather to the deck. The juice bar features soy smoothies, protein shakes, fresh juices, wheatgrass shots and more. If you need a caffeine fix, Tiger Lily's also serves black and tans, mocha blanca, Tahitian vanilla chai and Red Bull chai at the Java Bar. Green Earth is a health foods market offering an informal setting in front of the store for delicious, nutritious food. You can enjoy organic meals, fresh vegetable juices, smoothies and mostly vegetarian and vegan foods made on premises. Try the oyster mushroom burger with pine nuts and vegetables. There's an occasional turkey burger or tuna salad for those who prefer meat or fish. Located in Riverhead, the café is a great place to go before or after you visit the nearby Long Island Aquarium or take an Atlantis Explorer Tour Boat Cruise. Located in Long Beach, Bob's Natural Foods is a well-stocked health food store with a cozy café in the back. Established in 1975, it is Long Island's oldest independently owned health foods store. Choose from delicious wraps like the avocado and hummus wrap or a wealth of salads. In addition, there are delectable smoothies to please every taste. You can also purchase organic juices, wheat grass, and more. Jandi's Natural Market & Organic Cafe offers a wide variety of healthy foods including gluten-free, raw foods, and organic. Located in Oceanside, Jandi's is a 6,000 square foot natural foods supermarket and it includes a small cafe in the back of the store where you can relax at a table to enjoy the food and fresh juices, tea, and more from their vegetarian deli counter. This cozy cafe is located inside Port Washington's Dolphin Bookshop and offers casual fare that is vegetarian, sometimes vegan, and sometimes gluten-free. This isn't exactly a restaurant, but if you're in the mood for some good, quick vegetarian fare, you can buy a meal at the deli in this emporium of healthy food and enjoy it at small tables just outside the store. Cornucopia Natural Foods has a deli-cafe with a menu that features a variety of vegan, vegetarian, and raw dishes. While the offerings are mostly vegetarian, your carnivore friends can dine on organic, free-range meats. The fruit juices and smoothies contain only organic produce, and the desserts, such as the peanut butter tofu cheesecake, are all dairy-free and vegan. With a name like limani, Greek for "port" or "harbor," of course this high-end restaurant specializes in Greek-style seafood. But if you look at the appetizers, you'll see that most are, indeed, vegetarian. There's a mouthwatering plate of spreadable Greek salads, such as skordalia, a divine blend of ground almonds and garlic; and melitzanosalata, an eggplant, and garlic puree. The saganaki, or pan-fried Greek kefalograviera cheese, is also excellent. As for side dishes, horta is a delectable blend of cooked red, white and gold Swiss chard, escarole, dandelions, and spinach. The white and green asparagus is steamed and tossed with a vinaigrette, as are the grilled red and yellow peppers. Formerly known as Fratelli Iavarone Café & Backroom Trattoria, the upscale, renamed Iavarone Café serves delectable Italian cuisine. For vegetarians, this means plenty of savory non-meat appetizers and side dishes. Order the trattoria's superbly prepared polenta with a delicate mushroom and gorgonzola cheese sauce. With one or two appetizers like this, you won't miss a meat entree. ﻿After eating, drop by Iavarone Brothers Foods next door and buy some excellent Italian staples. You'll find plenty of non-meat choices to bring home. Along with a wide variety of sustainable seafood and grass-fed meats, this highly-rated cafe offers plenty of vegan and vegetarian options with many of the ingredients sourced from local organic farms. They serve breakfast, lunch, and dinner all day long, either to stay or to go. You can order real eggs, but there are also vegan versions, such as tofu "bacon" and even dairy-free "cheese."